Hi friends. 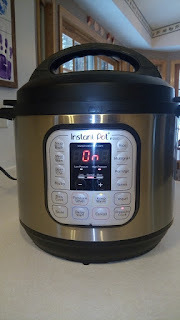 Are y'all curious as to how we're doing with the Instant Pot? Well, so far I've done the "water test," made hard boiled eggs, Kraft mac-n-cheese (yes, from the blue box, because I could), and warm-me-up sausage quiche. The hard boiled eggs took about the same amount of time as they would have had I steamed them on the stove, by the time the pot came to pressure, cooked, then released pressure, and were about as easy to peel, however 4 out of my 12 eggs cracked in the cooker. They're still good to eat, but they don't look very good. The Kraft mac-n-cheese also took about the same amount of time as it would have taken on the stove. The noodles were a little softer than we're used to, so next time (if there is a next time), I would cook for a shorter time and do a shorter natural pressure release. The one advantage was I only had one pot to clean, verses a pot and a colander. The quiche was not a success. I ended up baking it in the oven for 40 minutes after cooking it in the IP for 20. This was definitely not a time or energy saver, as I usually bake that quiche for 40-45 minutes anyway. In the Instant Pot's defense, I used a deeper dish than usual, and it was probably too full. But I wanted to make the full recipe so it would be a fair comparison, and my regular dish doesn't fit in the Instant Pot. If I had to decide right now, I think I would accept and use an Instant Pot if someone gave it to me, but I would not purchase an Instant Pot. I am so very thankful to have the opportunity to try before buying, as I'm thinking I would have a serious case of buyers remorse if I purchased one. Anyway, I have lots of Instant Pot recipes on the menu this week (and a few next week, too). Maybe the Instant Pot will reveal its gloriousness to me yet. Wish me luck! I'll keep you posted. Rice burgler--I thought about making this as a one pot meal in the Instant Pot, but I think for my first IP rice experience it should be just rice. So rice in the IP, everything else on the stove. Chicken chili verde--in the Instant Pot. I'll have to add more liquid because the 8 qt IP that I'm borrowing calls for a minimum of 2 cups of liquid. Trying to decide whether I should do this pot-in-pot or just straight up. Hopefully it'll be OK.
Maybe an Instant pot dessert? Like a molten lava cake?